We’ve seen over and over how PrinterLogic transcends industry and scale when it comes to optimizing your organization’s print environment. From healthcare to insurance, education to manufacturing, PrinterLogic can be deployed as a universal print solution to deliver simplified, centralized management of networked printers, print queues and printer drivers—ultimately saving organizations of any kind significant costs and resources in the near- and long-term. This was in a print environment with between 50 and 249 networked printers, under five print servers, and fewer than 25 sites. TechValidate’s study showed that PrinterLogic enabled this state and local government agency to achieve these massive reductions by making it easier for end users to locate and install printers, eliminating the need for extra print hardware, and enabling the IT staff to manage drivers and deploy printers with unparalleled simplicity. 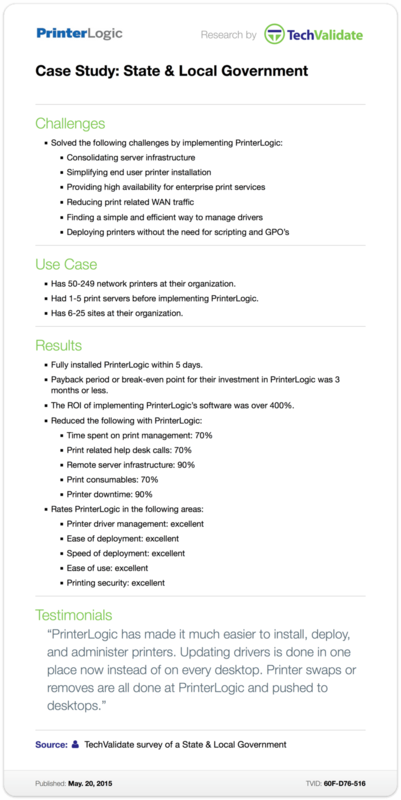 Furthermore, PrinterLogic reduced print-related WAN traffic and ensured that the government agency’s print services were consistently available for employees. These had both caused productivity problems before installing PrinterLogic—a process that, incidentally, was completed in under five days. And if that weren’t enough, the cost savings have been astronomical. This state and local government agency recouped its entire financial outlay for PrinterLogic in less than three months . The overall ROI since deploying PrinterLogic has been more than 400%, a relative figure that grows with every additional minute of printer uptime and every print consumable (e.g., toner, paper) that’s now conserved rather than wasted.